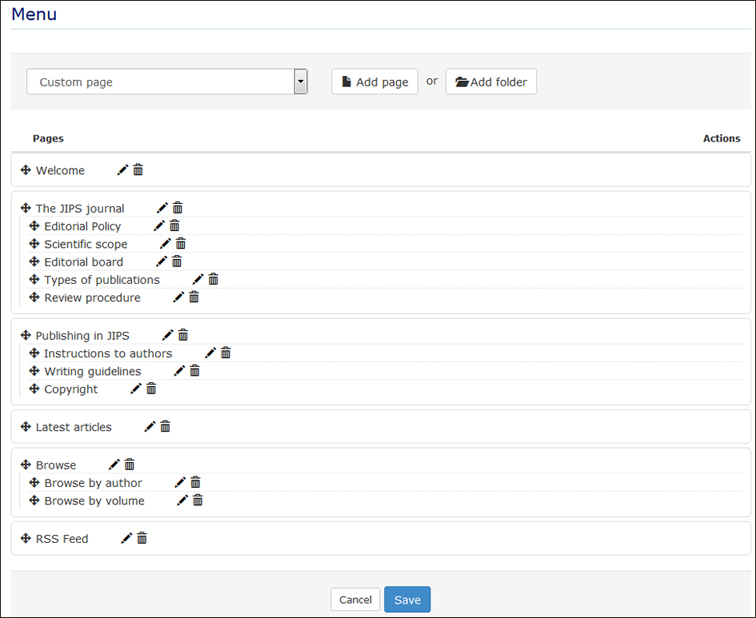 The website layout can be adapted (either by the webmaster or the editor-in-chief) to create a journal-specific identity. It is based on general drag and drop principles. 1) Choose the language versions needed. 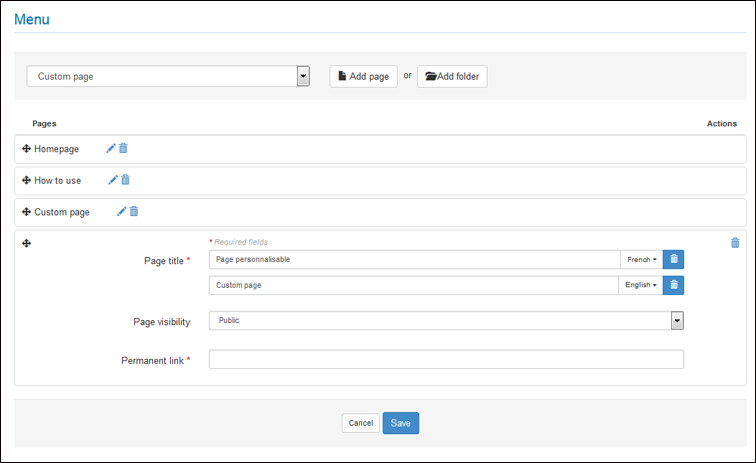 2) Create the home page, then the appropriate number of other pages (and subpages). 3) Customise the layout and the banner. 4) Choose the wished widgets. To set up the website, go to the menu Journal management/Website. The “General” tab sets the languages the interface will be displayed in – so far two possibilities: French and English. Select the wished language(s) by clicking on them (click and press Ctrl to select the second language if a bilingual website is needed). Don’t forget to save the selected settings. The “Style” tab is the place where to work on the layout of the website. by selecting the 1-click option, you will have the choice between two fixed models (colours, fonts and the rest are already defined). by selecting the simple option, you will be able to set yourself the colours (of the background and main zone), the colours, sizes and fonts of texts and headers. by selecting the advanced option, you will be able to directly create your own CSS. The “Header” tab is the place where to upload / enter images and text that will appear in the banner of the website. Click the “add a logo” button. If you want to enter text in the banner, select text in the drop down menu. You will be able to enter the wished bit of text, choose its style by selecting the CSS class(es) and style(s) and decide on its alignment. If you want to upload an image, select image in the drop down menu. You will be able to upload the corresponding file, set its size, link it to a website through a hyperlink, enter some alternative text and choose the alignment of the image. The “Menu” tab is the place where pages of the website are created, managed and deleted. You can either create a page or a folder (in which several pages can be gathered). A title for the page is required, as well as permalink. This is the suffix that will appear in the URL. You will also have to decide if the page is public or only visible to connected users. A page’s title and the visibility criterion are required to create a folder. To edit a page’s content, go to the page and click the “edit content page” button. If there is no text on the page yet, a textbox opens automatically. If there is already some text on the page, an intermediary page opens. Click the bin icon to suppress the text; or the pencil icon to modify the text. If you click the pencil icon, the textboxt opens with a text editor. 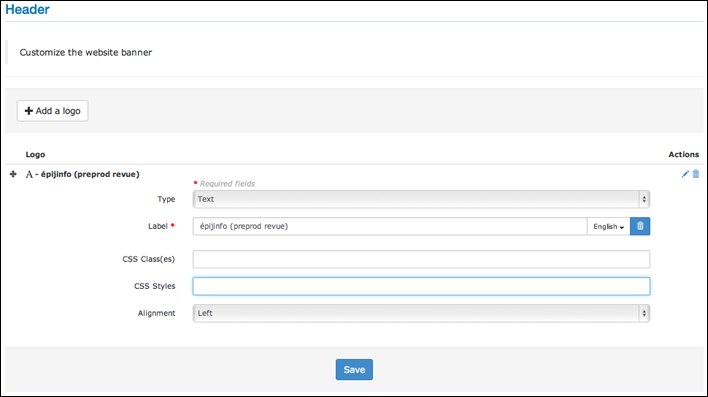 You will be able to enter some text and perform traditional editing tasks such as insert a table, a hyperlink, an image; create bullet points and lists; and choose appropriate formats for text chunks. By clicking the last tab on the right hand side, you will be able to directly edit the source code. When you are finished editing, don’t forget to validate the text by clicking the button at the bottom right corner of the textbox. If your website is bilingual, you will then have the possibility of editing the text in the second language. 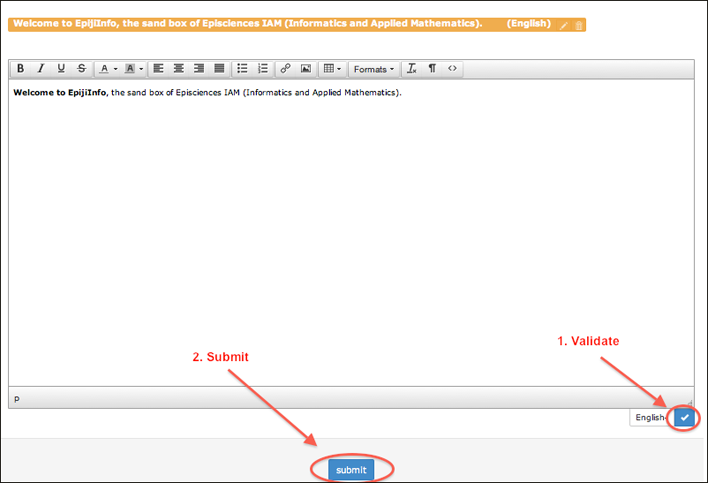 After validating, click “submit” to save the modifications. The “News” tab allows adding pieces of news to the News page. The “News” page must have been created in the menu. The “Resources” tab is the location where all resources of the website (files, images, etc.) are stored and can be accessed. 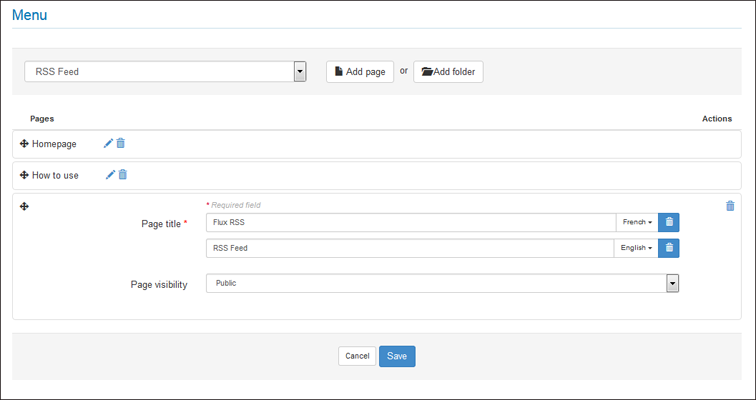 RSS feed can be added as a web page or as a clickable icon embedded in another page which already exists. NB : By default, the flow returns the last 20 items. It is possible to change the number of results by adding a parameter “max” on page (example: / rss / max = 50 papers or / rss / papers / max / 50? ).